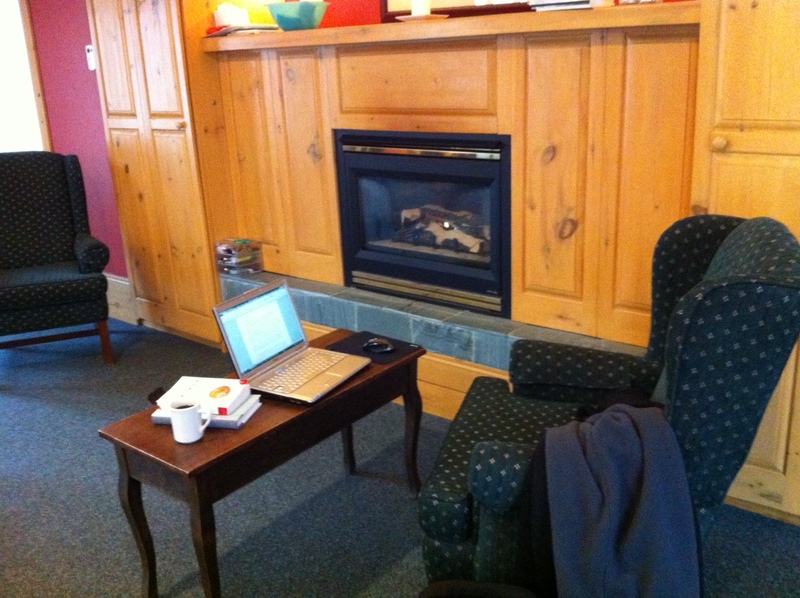 I just came from a lovely weekend writing retreat*. Two and a half days in a cottage on a lake; mealtimes with other writers; the sharing of work; walks on the lakeshore; an evening glass of wine by the fireplace with friends – but most importantly many hours of uninterrupted writing time. Almost 3,000 words worth. A retreat seems a bit like overkill for someone like me whose only work is writing and whose office is at home. Ok, sure, I manage our household, but it’s not like that takes an inordinate amount of effort. My family is supportive, self-sufficient, and immensely helpful. They do not need me. So, excuses aside, I have plenty of opportunity to write. 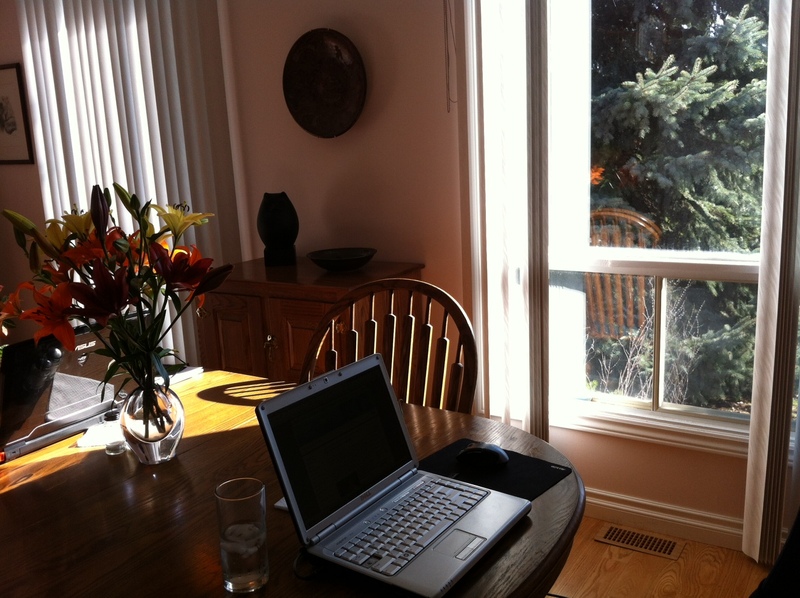 I do much of my writing on my laptop in one of my three home offices – the dining room table office with its east-facing sunny windows, right near the coffee and perfect for mornings. 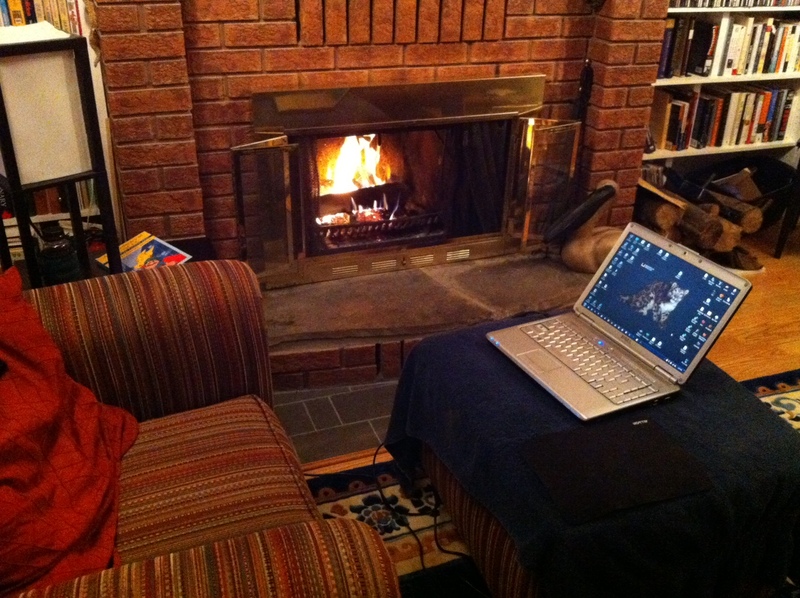 And there’s the comfy chair by the fireplace office, great on damp grey afternoons and snowy winter nights. Plus it’s right near all my books. And there’s the back deck office – ahhh, those summer days in the shade of big maples, surrounded by birdsong and lawnmowers. And there is nothing wrong with any of these places, except this: They are all at home. Now if you are a writer, I don’t have to tell you what that means. For the rest of you ..
It’s the distractions. They’re everywhere. And when they’re not, we make them up. (Am I right?) Distractions are what save us from a particularly sticky paragraph, a character that just won’t behave, an essay that’s about to collapse upon itself, or most importantly, from the Dreaded Blank Page. Far easier to clean behind the fridge, I say. Wow, is it 3:00 already? No, to write away is the only answer. 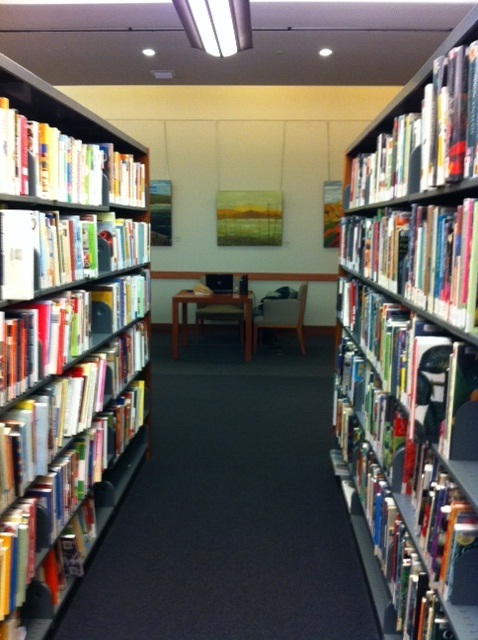 So I write away at the library a couple times a week. That’s where I do the heavy lifting – working on the essays for my book and delving into the good solid science blog posts . I also sometimes write in coffee shops, at the zoo, or just out in nature, places where the more freely creative work happens. And yes, I have written some fine material in those places. But to write away at a retreat, well that is a whole other thing. It’s an immersive experience. Writing is not only what you do there, it’s what you talk about, what you learn about, and what you share. All of the little diversions of life melt away and there is a measure of focus that carries across days instead of hours. Suddenly you find yourself writing really great stuff—the stuff that books are made of. So sure, you can write anywhere – even at home. As long as you have the tools of your trade, a bit of quiet (or not, if you prefer the buzz of life surrounding you), and some uninterrupted time, you can get the job of writing done. And that’s what I’ll keep telling myself … until my next opportunity to write away. Ah, how this piece rings true! Retreats may be an expensive way to get the work done, but they pay back in so many ways. And Ruth and Gwynn totally rock – they enrich and enhance the writing, and they make it fun. AND you get to hang with a batch of other awesome writers. Write on. Great post.